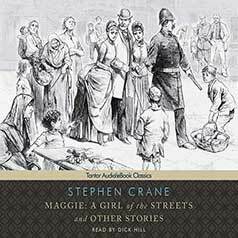 Maggie: A Girl of the Streets, first published in 1893, is a stark depiction of a young girl's life in the slums of turn-of-the-century New York City from American author Stephen Crane. Also included here are Crane's short stories "The Monster," "The Blue Hotel," and "His New Mittens." First published in 1893, Maggie: A Girl of the Streets is the first published fiction work of American author Stephen Crane. A harrowing depiction of a pretty young girl's life in the slums of turn-of-the-century New York City and her eventual decline into prostitution, Crane's novel is a starkly realistic examination of poverty and the challenges brought about by the rapid industrialization the United States underwent in the late 1800s. An enduring classic, Maggie is often regarded as the first example of naturalism in American fiction, a literary movement that included such authors as Theodore Dreiser and Upton Sinclair. This edition also includes three of Crane's short stories: "The Monster," "The Blue Hotel," and "His New Mittens."